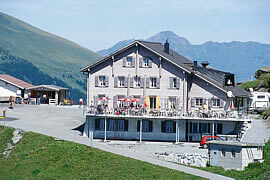 ATTENTION --- The Montain-Hotel Grosse Scheidegg is in the winter closed! With Grindelwald Bus you are in 25 Minutes from Grindelwald (1050 m) on the Grosse Scheidegg (1962 m). The panoramicview of the Bernese Alpes are beautifull.